Club heroes; every club has players from the past who particularly stand out and are remembered for many reasons. A club legend is admired by the vast majority of fans, who recognised that player played a huge influence at their respected club. Here at Shoot! we want to give these players the appreciation they deserve. Today, we turn our attention to the South of London and the town of Croydon. 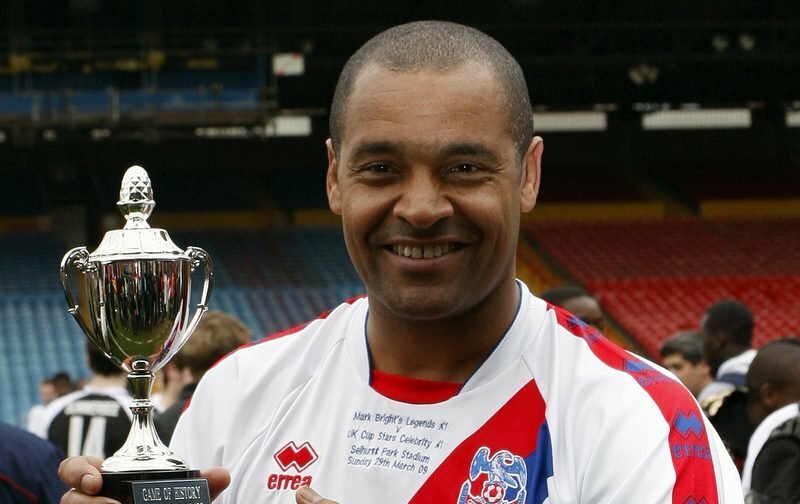 So many legends have graced the Selhurst Park pitch wearing the red of Crystal Palace. But one player is remembered with more fondness than most. FA Cup final day. The Twin Towers. The vibrant atmosphere. The day where legends are born. The sort of day every kid dreams about featuring in when a child. But, let’s face it, only a small minority can achieve such a dream. How some would only give to feature in a final for only three minutes. But to do it twice. Well, that is beyond anyone’s wildest dreams. Mark Bright has been fortunate enough to do the improbable. The only problem for the former Crystal Palace forward is that he has been defeated twice. But no matter what happened on that sunny Thursday evening in 1990, he can call himself a Crystal Palace legdend. While he is most remembered for his time at Selhurst Park, Bright began in the more humbling surroundings of Harrison Park, home of Leek Town FC. Now let’s be honest, it is no Wembley Stadium. But for Bright, it was an opportunity to play the beautiful game. Two years prior to his signing at the Staffordshire club, he had suffered one of the darkest days of his life, being released by Port Vale felt like the end. It actually turned out to be the start of the journey. And while working in a local factory, he began to create a buzz around the professional game. Ironically, the side who lured him to playing the game full-time was Vale, at last he would be able to play on the hallowed turf of Vale Park (well its perceived as “hallowed” when you’d being playing at Harrison Park). But still the dream of Wembley appeared a long way off. A goalless draw against York City in May 1982 may not be memorable for some, but for Bright it was the day that he was welcomed into professional football. After Vale gained promotion from the fourth-tier to Division Three in 1983 and Bright impressing under manager John Rudge, it was time for him to move on. The destination was Filbert Street, Gordon Milne desired his signature at Leicester City – then a side who flirted with relegation from the First Division into the second-tier. Following the departure of Gary Lineker to Everton, The Foxes needed a man to partner Alan Smith up front. For Milne, that man was Bright. However, it just didn’t quite work at Filbert Street. He netted on six occasions in 42 league appearances. Perhaps the jump was too much for him? Bryan Hamilton certainly thought so. Following Milne’s departure in the East Midlands, the number nine was immediately put on the transfer list. One man who thought he was good enough though was Steve Coppell, the former Manchester United midfielder who was in the dugout at Selhurst Park at the time. Bright decided to make the move to Palace. He didn’t really have any choice. It would be a move that would change his life. It would be a drop down in division, with The Eagles playing Division Two football at the time. But they would be playing First Division football in the next few seasons – well, that’s what Palace fans thought! Perhaps the challenge was bigger than initially thought. In 1987, they finished two points off the play-offs. In 1988, Bright won the Golden Boot, though Palace finished two points off the play-offs. The wait for top-tier football on a regular basis still remained a dream. But there was a growing confidence around the South London club going into the 1988-89 campaign. Perhaps this year could be the one where they finally taste the magnum of champagne for promoted sides? It was a season of dreams. The Eagles finished third, and despite not finishing in the automatic places, it did mean that they had the opportunity to enter the lottery of what is the play-offs. After defeating Swindon Town in the semi-finals, it was success in the final too, despite a 3-1 defeat in the first leg, an Ian Wright brace in extra-time gave them victory and a place in the first division. Crystal Palace chairman Steve Parish (Centre) and former player Mark Bright (Left). But still no Wembley. That was the next aim for the forward. It felt like it was all going to plan. Victory over Cambridge United in the 1989-90 FA Cup quarter-finals secured their place in the last-four. As Crystal Palace fans around the country were glued to the cup draw on the radio, their hearts sank, it was Liverpool, the side they lost 9-0 to earlier in the season. Cue the greatest FA Cup semi-finals weekend ever seen. Later in the day, Oldham Athletic were narrowly defeated by Manchester United, before Villa Park was the destination for Coppell and Palace. Alan Pardew’s late goal secured victory, it secured a place at the Twin Towers for Bright. This was his time to shine! The day he dreamt about as a kid. It was the opportunity for him and Wright to show off their formidable partnership in front of the world. That was if Wright would be able to perform to the best of his ability, as questions about Wright’s return from a broken leg dominated the build-up. Substitute Wright gave them hope and secured a replay, perhaps it was written in the stars after all. But Thursday May 17, 1990, was a day that will forever be remembered by Manchester United fans as Sir Alex Ferguson won his first trophy with the North West club. Some dreams just do not happen. This was the peak of his and the future Arsenal star’s partnership. A hat-trick for both against Southend United in the League Cup at Selhurst Park in September of 1990 proved to be a day that Palace fans will never forget. But all good partnerships must come to an end. Wright’s capture by George Graham and Arsenal in 1991 signalled the end for Bright at Palace. He made the move in 1992 to Sheffield Wednesday. After FA Cup defeat again (against Wright’s Arsenal) in 1993, as well as a League Cup loss that year (once again, against The Gunners) proved to be his highlights in the Steel City. After unsuccessful spells at Sion and Millwall, he ended his career with Alan Curbishley at Charlton Athletic, going out on a high playing Premier League football after play-off triumph at Wembley in 1998.